Ya Allah! Isn't it amazing? We often grumble & frown if there's a minor plumbing problem in the washroom or if the microwave isn't working well enough .... and look at this! Makes us look so small and teaches us how much more we still need to learn. May Allah Almighty take care of them, and protect all of us from the zulm of the zalimeen. Ameen. Incredible indeed. Amidst all their pain and suffering, one cannot overlook their lively spirit, courage, perseverance and patience by accepting life will all its numerous & horrific odds. You're so right sister Zeynab. It really does make us look so petty when we think of the kind of things we keep complaining & grumbling about. These are lessons for us to learn from, lest we be put through similar tests and fail miserably. Ya Allah, grant us the same courage in case something terrible happens in future and please help us to pass through our tests to Your acceptance. Ameen, ya Allah. 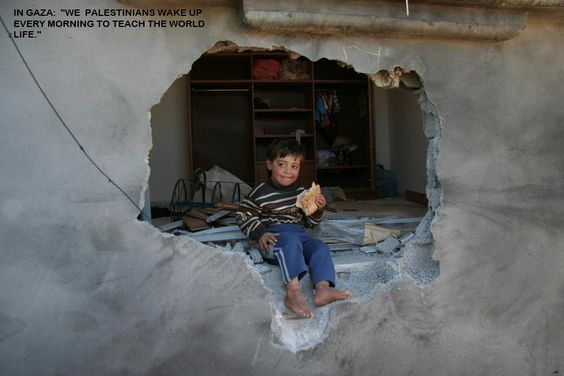 ahhh innocent childrens and people of gaza teaching us lots of lessons every day !